All-America Selections winner. Tough plants for tough places. Ground-hugging, succulent-leafed carpets glow with single or mini-rose double blooms that open only in the sunshine. Sow outdoors after the last frost or start indoors 4-6 weeks earlier. Space 6-8" apart. A winner in hot and dry areas and perfect for containers. 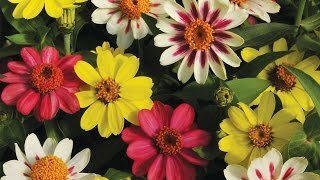 Sundial Mix is vigorous with large 3" double flowers that stay open longer than other varieties. Fuchsia, pink. orange, scarlet, yellow and white. Sensational peach-coral blooms. Portulaca may be grown from seed sown early indoors and transplanted outside after frost, or sown directly in the garden after frost. Choose a location in full sun with very well-drained soil. Sow seeds thinly and evenly and cover with 1/8 inch of fine soil. Portulaca may be grown closely together and usually does not need to be thinned. Portulaca is drought tolerant, but plants need about 1 inch of rain per week during the growing season. Use a rain gauge to check to see if you need to add water. It's best to water with a drip or trickle system that delivers water at low pressure at the soil level. If you water with overhead sprinklers, water early in the day so the foliage has time to dry off before evening, to minimize disease problems. Keep the soil moist but not saturated. After new growth appears, a light fertilizer may be applied. Keep granular fertilizers away from the plant crown and foliage to avoid burn injury. Use low rates of a slow release fertilizer such as Flower-tone, as higher rates may encourage root rots. Portulaca is ideal for containers. Take care not to overcrowd them or the flowers may be significantly smaller than they should be and the plants may be taller. Always use a commercial potting mix, do not use garden soil, and make sure the containers have adequate drainage. Container grown plants will require extra water and fertilizer, look for signs of wilt or a nutrient deficiency. Portulaca is perfect for rock gardens and for beds and borders in drought-prone areas. It grows nicely between paving stones. The plants have a spreading habit, so they cascade gracefully from hanging baskets and window boxes. They also make a great annual groundcover. Portulaca often will self-sow. If you want it to do so, allow some seed to ripen on the plant at the end of the season. Portulaca, Sundial Hybrid Mix is rated 3.7 out of 5 by 6. Rated 4 out of 5 by HighColdDesert from Great for pots in hot sun I bought a packet of these a few years ago and have always planted pots, for my desperately hot sunny high-desert location. Pros: I have had excellent germination with Burpee portulaca seeds, even after a few years. I prefer the separate seeds to the pellets. They really do thrive in a pot on a hot sunny patio in my hot desert location. Con: The white flowers turn to greyish mush that looks like a damp tissue was used to wipe away soot and thrown in the flowerpot. The other colors don't look bad when they fade, but the white flowers really look shabby. This year I think I'll rogue out the white flowered plants. Suggestion: I plant portulaca in pots with spring bulbs. The portulaca starts blooming after the bulbs' foliage has died back, and it makes me remember to keep watering the invisible bulbs. The portulaca gets killed off by the frost long before the bulbs poke up. Rated 2 out of 5 by Sherril from Not easy to start from seed. I followed the instructions with regard to starting the seeds inside and transplanting after the second set of leaves arrived. Out of 100 seeds I transplanted 15 seedlings into secondary pots. Of those, seven made it to the garden and are doing very well. The seedlings come up first looking like red hairs. Most of mine didn't develop first leaves. About 35 did however get their first leaves but quit and wilted. 15 got their second leaves though. It would help to have access to pictures of what the seedlings should look like so they can be recognized early. Rated 1 out of 5 by Sarmila from None of the seeds germinate I am so disappointed that none of the seeds germinated, so wasted my money and time. Rated 5 out of 5 by nancys Portaluca 2015 from beautiful little sweet and petite flowers This plant is so hard to find in the town that I live in... usually by now, we have found at least five to six packs of these flowers.. but this year we can't find them. I believe word got out that we love this at our house and people saw it growing in my two strawberry pots and bought it all up.. usually big box stores have this.. but last year it was also a bad year to find it.. normally we put it in the pots about the end of March or around Easter. It takes root easily.. keeping it watered and when the ground gets warm to make the vegetables germinate.. we have an almost full pot of it and is thriving so well.. My mom use to love this stuff.. and she always managed to find some every year but me being tied down with my kids and last minute schedule planning for next year.. she would get out earlier in the day than I could.. my son loves this stuff probably because she grew it and its a pleasant memory for him.. he is 27 years old.. and Mom went to Heaven 19 years ago.. so its been a while since she was around. She use to tell me stories of it being so easy to grow.. and how they use to call it Rose Moss. Its always been a favorite of mine.. I have not ever planted it in flower beds.. normally I use it in a large basin with several other drought resistant plants such as Caladiums of the white variety (so hard to find in these parts also) and we would vary the plants between bulbs and Periwinkles( another dry heat loving plant.) I see Rock Gardens with beds such as seen here around town.. I think even with this late season to plant seeds.. it will be hardy out even sometimes surviving a little bite of frost.. but Portaluca will adjust its sails and moved on.. being a real tough plant that you almost can't harm it.. it loves the pure 100 % hot Sun, which we get plenty here in the deep South.. being just about an hour from the metropolis of Atlanta.. we get so much sun.. expecting all that rain from Texas where they received over 16 inches of rain this week as of April 19, 2016.. we are expecting some rain in the next few hours really.. I most definitely would recommend these small jewels of Summertime.. fertilizing these things will make the little green tubular stems sturdy and they become very dark green and alive. These stems glisten in the early morning of Spring/Summer and it almost appears to be ice like in Nature and beautiful to see.. on a cool Spring mornings of mid-April, I am finding my Strawberry pots empty as of today April 20, 2016. Looks like what we have reappearing from the now warm empty pots from last year.. We are determined to have some either by hook or crook.. not stealing any.. cant find any to steal and I would not do that..it would die on me.. just because.. Needless to say, from the size of this review, someone or everyone will either pass right over this or I will become part of the loving Archives of Burpee.. there is a review from ten years ago.. I will read it in a few minutes.. as soon as I sign off of here and get the packet seed I want and the money in an envelope. Burpee, thank you, for offering the seeds and, at least, I will try to carry on my mother's tradition of these beautiful small creations while my children's granddad, a painter of company signs by hand, a dying form of creativity and art..He is helping God pick out the color of in the morning's sunrise in the Heart of Dixie. Image 1--Using one of the pictures here of a Rock Garden on burpeeseed.com. The rest of these are my own Portaluca, "Rose Moss" from last year's Strawberry Pots, rustic as they can be with the character of the cold Winter before, 2015. Rated 5 out of 5 by WarrenandWendy from Exquisite bedding plants We have been growing Sundial Hybrid portulaca for a number of years at our farm in Monroe County, Wisconsin. They can be very tricky to get started but once going they are unstoppable and flower until the frost. We start them in 2" x 2" plastic cells in flats using a dampened, sterile growing medium. It they aren't pelletized, the seeds are nearly microscopic so getting an even spread is difficult. I use a shallow measuring spoon - 1/2 teaspoon - to scoop up the seeds, then tap the handle while moving slowly over the flat at a height of 6-8" above the medium. I try to spread a few at a time and make several passes. I then cover the flat with plastic film and put a sheet of newspaper over that. The newspaper keeps the flat from overheating if sunlight or bright room light should fall on it. The seeds sprout in about a week at room temperature, with tiny filaments showing above the medium. At this point we remove the newspaper and plastic film and keep the seedlings moist with a mister until they show leaves (2 weeks?). After that we are set - the seedlings will do just fine in a sunny window until they are ready to plant - maybe a month later. Have fun!